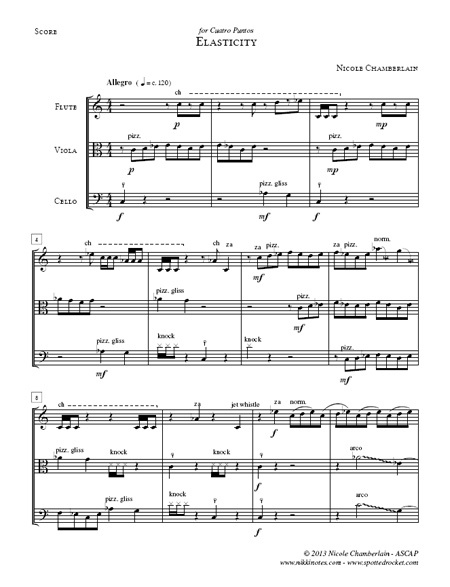 "Elasticity" was written for Cuatro Puntos specifically for the ensemble�s 2013 Fall tour in Bolivia. The composer, who is also a flutist, has always been enviously of string players who could drastically change sounds their sound by using different bowing and plucking techniques. This composition challenges the flutist to mimic those sounds using various techniques including beat boxing and pitch bending. The Merriem Webster dictionary translates elasticity as the capability of a strained body to recover its size and shape after deformation. Throughout this piece the tonal center struggles to move away by a quarter tone or more using pitch bending, glissandos, and modulation. No matter what develops throughout the piece the musicians always find themselves at C, right where they started in the beginning.